If you judge the world based solely on games, your perception of Japanese players would be irrevocably skewed. 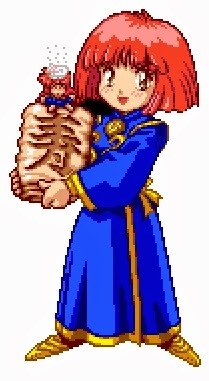 While there are a massive amount of convention titles being released from the house of Nintendo and Capcom, there clearly is also a very large audience that seems to love the excessively cute in much the same way as there are games simply for those who love the bizarrely weird. For every game aimed towards an audience of teenage boys with a penchant for scantily clad women and innuendo, there seems to be just as many games with a focus on the cutsey and adorable. If the title hasn’t been enough of a clue, from the first five seconds it’s pretty apparent who ‘Cotton 100%’ is aimed at. If ‘Kiki’s Delivery Service’ and ‘Gradius’ somehow became fused into one game this would be the result. 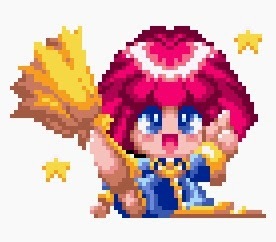 A horizontal shooting game with a hero on a broomstick set in a world of magic and far too many colours. Considering that ‘Cotton 100%’ falls into the cutsey category, bizarrely its closest point of comparison would be ‘Parodius’. It’s a game that is guilty of copying huge chunks of a game that copied huge chunks from other games. Right from the start the extent of this Konami imitating is obvious, when ‘Cotton 100%’ allows a choice of four types of weapon and multiple attack configurations, presented in a way that seems indistinguishable from ‘Parodius’. 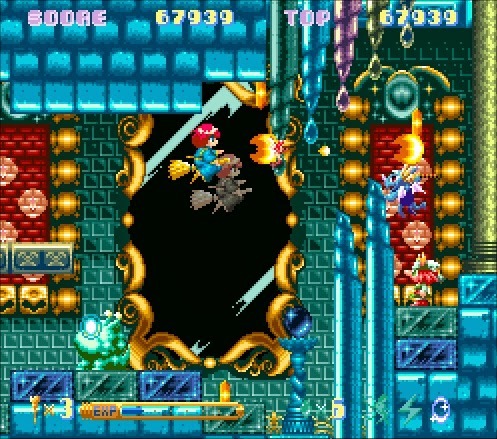 Even the basic controls and weapon types have been lifted from the avant-garde parody shooting series with the level templates too mirroring the genre leader. Each stage scrolls left to right and requires you to shoot wave after wave of enemies, following set patterns. Some enemies drop crystals that build up your XP gauge, allowing access to better weapons and magic. Without such upgrades it’s a struggle to beat the mid and end of level bosses. 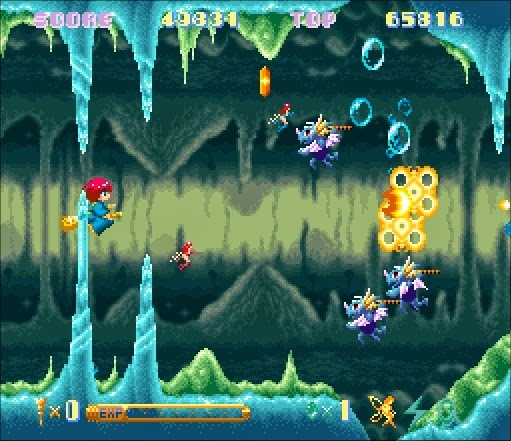 As is the genre tradition, these are typically large screen filling foes, however they lack the scope and imagination seen in the 'Parodius' games. ‘Cotton 100%’ doesn’t expect you to fly through the legs of a belly dancer or destroy a patriotic turkey or pirate cat ship. The game does however ask of you to shake a squirrel from tree and dodge the projectiles of a baseball bat wielding snowman. Super Play in their review noticed this pretty apparent similarity between ‘Parodius’ and ‘Cotton 100%, but made the salient point that “if you’re going to steal anyone’s ideas make it Konami’s”. 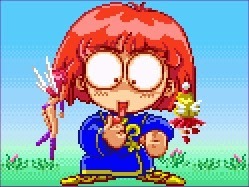 Aside from it’s all out silliness, Konami games are known to have incredible graphics and sound. It is here, that ‘Cotton 100%’ actually eclipses its inspiration, offering some absolutely stunning screens. From a cloud city covered in snow and cascading stars, through claustrophobic caves and underwater stages. Sadly, this astonishing level of visual splendour does come at a cost which effect game play in a number of ways. Most obviously is the painful slow down which becomes so regular it’s almost a game play feature. 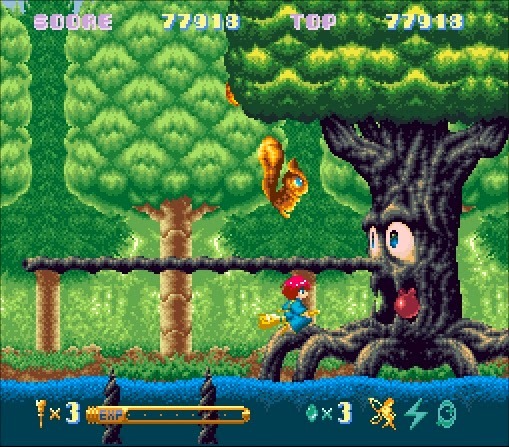 When the screen becomes too busy, the game stutters to a near halt, which is quite a significant issue on the later difficulty levels when twitch controls and rapid reflexes are depended upon. Even on easier modes though, the amount of detail on screen does actually make it hard to even see where Cotton herself and her opponents are. As Tony Mott put in his review for Super Play “picking out what’s happening in the foreground can be a nightmare. The graphics whilst being pretty terrific can sometimes make the game trickier than it needs to be”. Dense jungles and waterfalls look spectacular in pixel form, but when they conceal your character or your enemy they become a beautiful hazard. That being said, unlike other horizontal shooters, the background can never kill you by simply touching your playable character. It’s always been a huge irritation in ‘R Type’ and ‘Gradius’, that just brushing against the floor or ceiling results in death, so I do appreciate ‘Cotton 100%’ for being more forgiving. In this game, plunging into the floor will result in you simply getting slowly pushed off screen and unless you fail to avoid the screen edge it will not take a life. This does make the game slightly more lenient than other games of the genre. Reducing the challenge further, each continues returns you to the precise point you failed in a level, rather than forcing you back to the start. This makes the game feel less repetitive, but the general brevity of the game seems to be an issue for some, especially when you consider the price ‘Cotton 100%’ commands on sites like eBay. The game though really is as long or short as you wish to make it. As pointed out in Super Play, “You won’t get your money’s worth if you play it on Easy or Normal modes” and on theses difficulty levels you’d struggle to play the game for longer than an hour before you complete it. 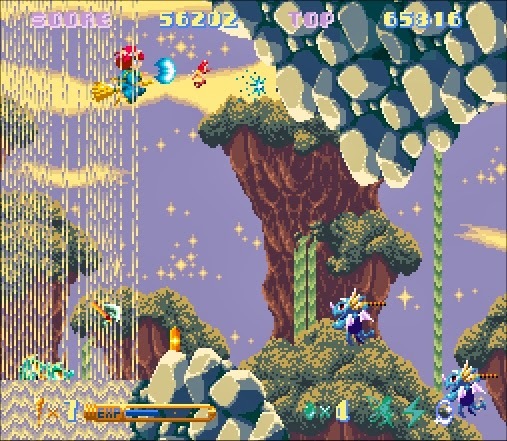 Indeed, pressing select enough times on the title screen will give you 9 continues and with 9 lives per continue its neigh on impossible not to complete the game. 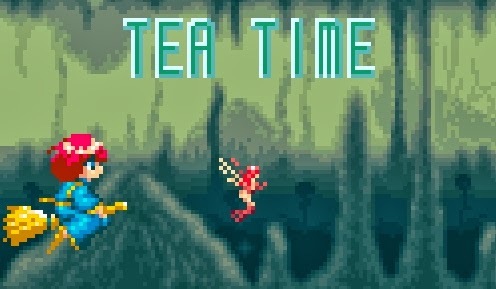 Of course, in ‘UN Squadron’, despite anime characters being front and centre, at no point will they enjoy ‘Tea Time’ at the end of a stage where the goal appears to be to catch as many falling teabags as possible. ‘Cotton 100%’ never takes itself remotely seriously, but given that this game is Japanese, with no western release or translation a lot of the humour and charm can get lost. I too, without a friend able to read Japanese, would have had no idea what was going on as I was unable to decipher the kanji characters that tell the story between stages. On this occasion ignorance actually lessens the enjoyment and the drive to play the game. The story certainly isn’t a life affirming morality tale, but it is great fun in a silly quirky way. 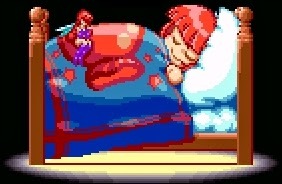 The game is set in the peaceful country of fairies, known as 'Meruhen Land'. Here a magical energy called ‘willow’, is harvested from grass and turned into sweets for the county folk to enjoy. Sadly though, it is being stolen by a malevolent force, much to the dismay of a friendly witch called Cotton and her fairy sidekick Silk. Driven by an addition to the sweet stuff, candy-obsessed Cotton sets off on an adventure that will see her blast her way through the seven stages of achingly cute adversaries with the sarcastic Silk in tow. 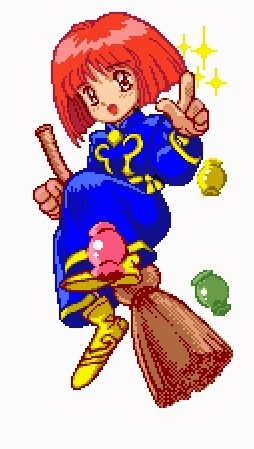 Even without knowing who this witch is and understanding her penchant for willow grass infused treats, there’s still enjoyment to be had by looking at the cut scene art between stages. Who wouldn’t want to giggle at the range of Cotton’s extreme emotions? It’s silly, but I think it’s appealing. It’s a nice motivation to get through stages, even though when they are this fun anyway and no extra impetus is really required. When you have spent dozens of hours lost in the world of JRPGs, or when you’ve spent too long scratching you head over puzzle games, sometimes you just fancy something silly and fun. ‘Cotton 100%’ may be short on normal, may be slightly repetitive and maybe so sweet it actually hurts your teeth, but these are three reasons why it may also be fantastic. How did I get this game? Considering, the two games that I keep comparing ‘Cotton 100%’ to are widely considered amongst the best shooters on the Super Nintendo, its praise indeed that it matches up. Clearly a very different game to both, but certainly as enjoyable to play. The slight fly in the ointment though is the price that people are willing to pay for it. To get a boxed complete ‘Cotton 100%’ you’d be lucky to spend less than $100, especially if it has the mini CD. For that money you can easily buy both ‘Parodius’ and ‘Un Squadron’ with change to spare for ‘Super R Type’ and a copy of ‘Kiki’s Delivery Service’ on DVD to meet your cutsey needs. Twenty years ago, Tony Mott advised people to “keep an eye on importer’s special offers, you may well be able to pick this up for£20-£25 and that's a much fairer price”. The advice still holds true today. I managed to get one that was listed without the CD mentioned in the description (but the picture showed it). Consequently no one bid against me and I got the complete copy for a quarter of the going rate. It pays to wait!